Purva School of Bharatanatyam aims at providing all round cultural development to its students. By carrying out several activities, Purva develops deep interest in all kinds of Indian art forms, making students aware and respect other cultures and traditions. In this way the students at Purva learn about the moral values & Indian ethos. Purva organizes many activities and events for the benefit of the students as well as the art lovers. Purva carries on different cultural exchange programs and supports interactions between artists of various art forms. Purva invites exponents of other dance forms, conducts workshops and lecture demonstrations. 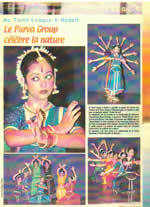 Purva also hosts national festivals of dance that showcases the talents of artists of International repute. Purva encourages young and upcoming artists by providing them an opportunity to participate in the major dance festivals. Purva provides platforms for the school students by conducting the annual dance festival. Purva conducts Arangetral [ Solo dance recitals] of its senior dance students. Purva felicitates artists with an aim of bringing awareness to the younger generations. Purva carries out photo sessions on dance so as to help students have a lifetime memory of their association with dance as well as Purva. Purva designs brochures , program folders, costumes for students as well as dancers. Purva also provides ornaments, books and any other assistance required in this field. Purva believes in supporting social and cultural institutions by contributing towards noble & charitable causes.